What to study Student Lifestyle Should international students take the ACT? Just as with American students, there’s no clear-cut yes-or-no answer. If you’re applying to college in the United States, you will almost certainly have to take one of the big two college admissions tests, the SAT or the ACT (American College Testing). Most schools in the United States accept both exams, so this probably won’t be a deciding factor. However, there are definitely some important things to take into consideration, including your natural talents, your education, and the resources available in your country. The ACT has both an English and a Reading test, equivalent to the SAT Verbal sections (but the ACT calls them “tests,” rather than “sections”). For many international students, this is a determining factor in choosing which test to take: the overall, “composite” ACT score averages your scores from English, Reading, Math, and Science, while the SAT combines your scores by adding your Quantitative and Verbal sections. So in both cases, your mastery of English will affect about half of your score, not taking into account nuances of word problems on the math sections. Some key differences: there’s greater time pressure on the ACT, so if you find it difficult to work quickly in a foreign language, the ACT may not be for you. On the other hand, anecdotal evidence suggests that the SAT’s reading comprehension and grammar questions are more nuanced. When choosing between the ACT and the SAT, you’ll need to decide: do I want to approach questions faster or try more difficult questions? Reading passages on the ACT is also a little longer, generally, but vary less in complexity than SAT passages. The best way to decide if you should take the ACT? Take an ACT practice test and see how you do compared to an SAT practice test. In some countries, students’ education becomes specialised very early on. By the time you’re in high school, you may already have chosen a particular “path,” even if this is as generalised as “science” or “humanities.” If you are specialising in science, you may want to consider taking the ACT, although be careful: the test is made to test scientific reasoning far more than scientific facts, so practice first! Because of this focus on reasoning, it’s also important that you don’t let yourself be scared off if you haven’t taken a science course in a few years. Yes, you’ll have a little catching up to do, but the scientific knowledge on the ACT is relatively basic. Check out an ACT study guide to see the exact concepts that the exam tests and how, and you’ll see: thinking logically is more important than memorising the periodic table of elements on the ACT! It’s true that, unlike many American students, you may not have access to resources such as the PreACT, or a version of the ACT given to younger students. Furthermore, you’ll be more limited by the ACT test dates available in your region (but note that SAT test dates are also more limited abroad). 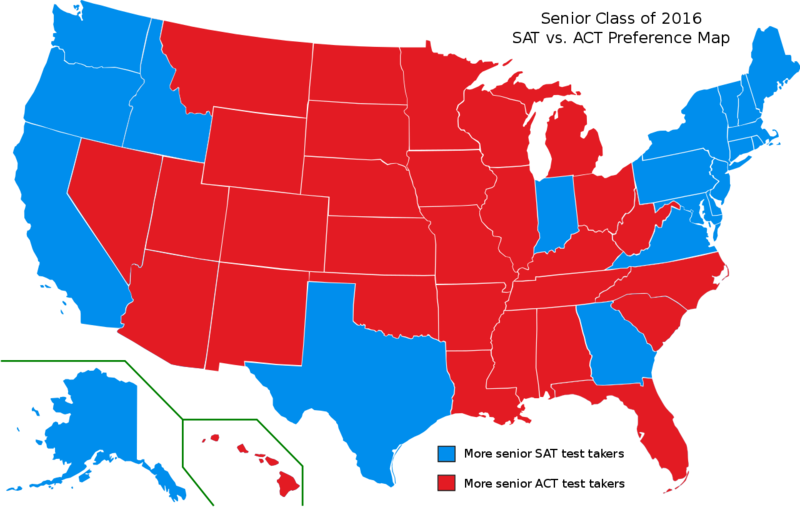 However, those are the two big limitations, and they apply just as much to the SAT as to the ACT. Even just a few years ago, international students were put at a disadvantage when taking American college admissions tests because good prep options weren’t available abroad: a lot of American students took classes or studied with books that could only be found in the U.S. However, today, tutors and classes are available around the world, and great Internet resources – many of them free – exist to help students from every country do the best that they can on the ACT and SAT, giving them a leg up in the admissions process. At the end of the day, consider your options carefully when deciding whether to take the ACT or the SAT. You probably will have to take one or the other, though! Admissions offices appreciate seeing IB results, as well as those from similar tests, but usually still require a standardised American admissions test, as well as an English test (TOEFL or IELTS are the most popular). Take your English test before your ACT or SAT so that you can sharpen your English skills well in advance of the exam. That way, you can focus on mastering the test format so you can show off your skills to their best advantage when test day finally rolls around. Special thanks to Rachel Kapelke-Dale for providing us with this article. Rachel is a test prep expert at Magoosh. She has a Bachelor of Arts from Brown University, an MA from the Université de Paris VII, and a PhD from University College London. She has taught test preparation and consulted on admissions practices for over eight years.